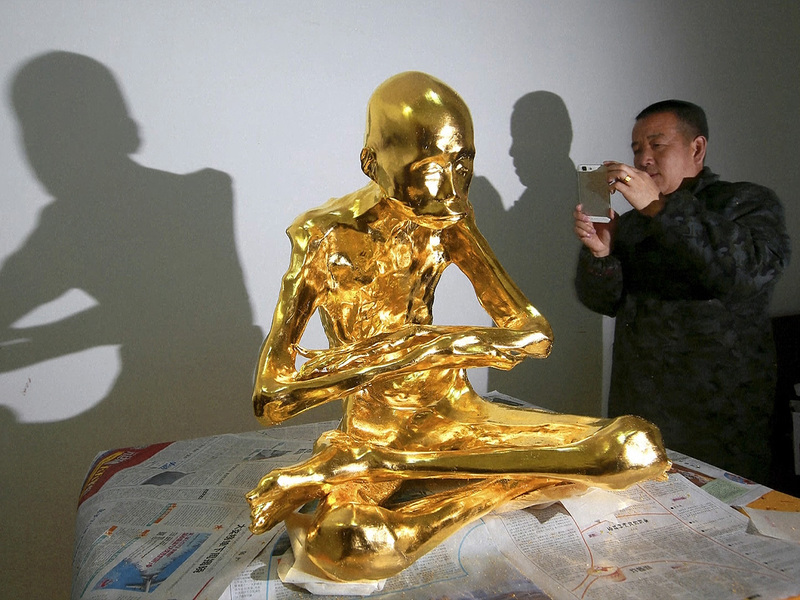 BEIJING -- A revered Buddhist monk in China has been mummified and covered in gold leaf, a practice reserved for holy men in some areas with strong Buddhist traditions. The monk, Fu Hou, died in 2012 at age 94 after spending most of his life at the Chongfu Temple on a hill in the city of Quanzhou, in southeastern China, according to the temple's abbot, Li Ren. The temple decided to mummify Fu Hou to commemorate his devotion to Buddhism -- he started practicing at age 17 -- and to serve as an inspiration for followers of the religion that was brought from the Indian subcontinent roughly 2,000 years ago. Immediately following his death, the monk's body was washed, treated by two mummification experts, and sealed inside a large pottery jar in a sitting position, the abbot said. When the jar was opened three years later, the monk's body was found intact and sitting upright with little sign of deterioration apart from the skin having dried out, Li Ren said. The body was then washed with alcohol and covered with layers of gauze, lacquer and finally gold leaf. It was also robed, and a local media report said a glass case had been ordered for the statue, which will be protected with an anti-theft device. The local Buddhist belief is that only a truly virtuous monk's body would remain intact after being mummified, local media reports said. "Monk Fu Hou is now being placed on the mountain for people to worship," Li Ren said.